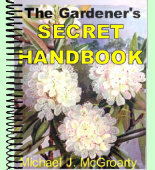 Perennial growing 1-2 feet high in moist woods and clearings, can grow in 100% shade to 50% shade, does best with 70% shade. Umbrella-like leaves that are waxy emerge in early April, and a white flower follows, April-May. An egg-shaped edible fruit occurs after flowering. Mayapple is used in medicine. 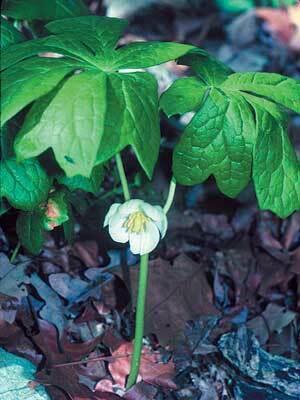 Mayapple usually grows in patches in the wild and the early foliage is lush and attractive. Plant 2 inches deep in moist soil and mulch. Mayapple's wild range from Maine to Florida west to Texas.